So, you have survived the bleakness of January and we are now in February, with Spring just around the corner things are starting to look up. As I’m sure you are aware, today is Valentine’s Day (also known as Saint Valentine’s Day or the Feast of Saint Valentine). The debate will rage on for years regarding whether today is about the celebration of love and affection, or whether it has become just another marketing vehicle. As a digital agency, we will be focusing on the latter! There have been many generic pieces of content rolled out in previous years, women swooning over roses or the unlucky (or lucky, depending on your view!) singles consuming vast amount of ice cream in a tedious Bridget Jones recreation. At MintTwist however, we have scrawled through scores of old Valentine’s Day content to find some of the more innovative and eye-catching efforts of years gone by. Here are our favourite 5 – in no particular order from years gone by. This encouraged Facebook users to share their first kiss stories last Valentine’s Day. Cute. Engaging. Simple. This certainly ticked all the boxes for an effective piece of Valentine’s Day content marketing. This reinforces that content doesn’t necessarily have to be all singing, all dancing with a huge amount of interactive element. It just requires to provoke an emotion & to be seeded correctly. This particular post in question garnered 13,000 likes and 33 shares. All from a few short, but sweet lines! Not bad eh? In 2012, around Valentine’s Day, drink company ‘Innocent’ created the idea of ‘Love Labels’. 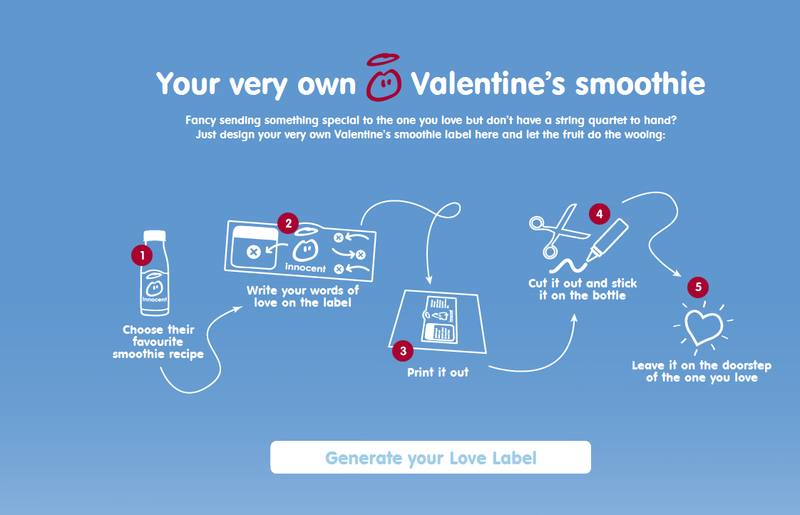 They asked consumers to pick their partner’s favourite smoothie and create a personalised label. This could be done by writing their own message or choosing existing ones, as well as adding various graphics. Once finished, they can print the label out and stick it on the bottle – producing a personalised gift for a loved one. Additionally, consumers were encouraged to share their labels on Facebook and Twitter. User Generated content eh? Feels like 2015 all over again. But this really does show that positioned in the right way, it can really work. 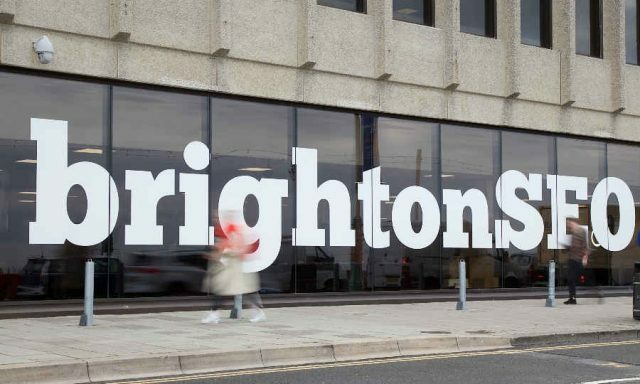 This is slightly different to many other Valentine’s Day content pieces, as it moves away from the digital world and inspires a degree of creativity. Unfortunately the service is no longer available but here is a brief look at what it was all about. Those of you who have seen Deadpool, will be aware that it hardly fits the romantic comedy stereotype of films typically released in the build up to Valentine’s Day. For those of you who have not seen it, this quote from the snarky Ryan Reynolds will probably shed some light: “Looks ARE everything! Ever heard Dave Beckham speak? It’s like he mouth-sexed a can of helium. You think Ryan Reynolds got this far on a superior acting method?”. Starbucks and Match.com teamed up in 2015 to offer singles the opportunity to connect over a coffee at Starbucks. The partnership came about after data from Match shows that 3 million of its members list “coffee and conversation” as one of their interests. These members were able to use a new Meet at Starbucks feature on the app, which allows users to send an email to someone they might like and find a convenient Starbucks location. Additionally, on February 13th 2015, participating Starbucks stores across the globe were involved in the World’s Largest Starbucks Date. Customers were complemented with in-store experiences which helped to facilitate connection, such as in-store music playlists and photo props to document and share your own #StarbucksDate. Advertising agency McKinney teamed up with Hooters to launch the ‘Shred Your Ex’ campaign in the run up to Valentine’s Day 2015. Fans were asked to get in contact via Social media; Tweet or Instagram an image of their exes with the hashtag #ShredYourEx and then visit shredyourex.hooters.com to watch a live feed of your photo printing directly into a paper shredder above a digital fire. In case you were wondering what happened to all that shredded paper, it went to a good cause. The shreds were donated to a local animal shelter and used as litter for kittens. Further strong PR work! Seen any examples of Valentines-inspired content marketing this year? Tell us!